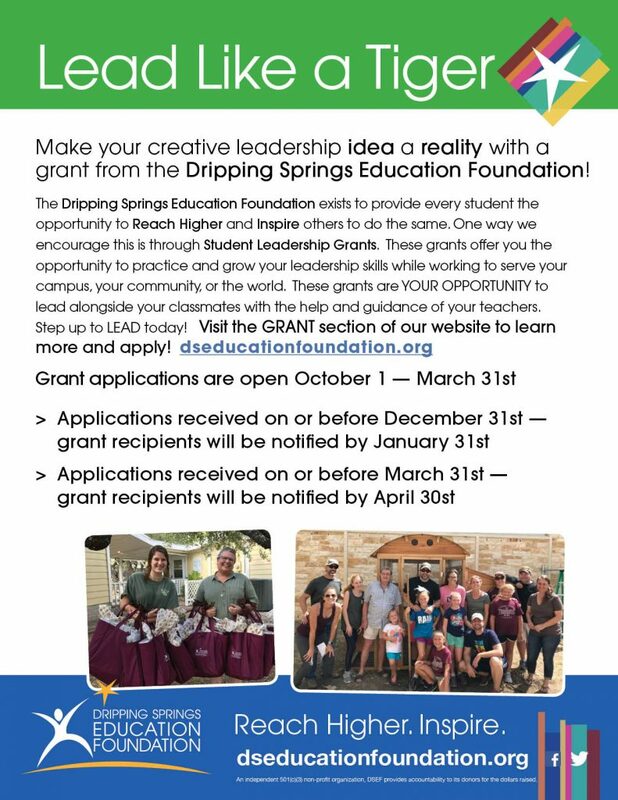 The DS Education Foundation is now accepting Student Leadership Grants starting October 1 and ending March 31. DSEF has a long tradition of recognizing leadership among our students. The Student Leadership Grants are designed to foster the development of students' leadership skills through their efforts to serve their school, community, or others in the world around us. 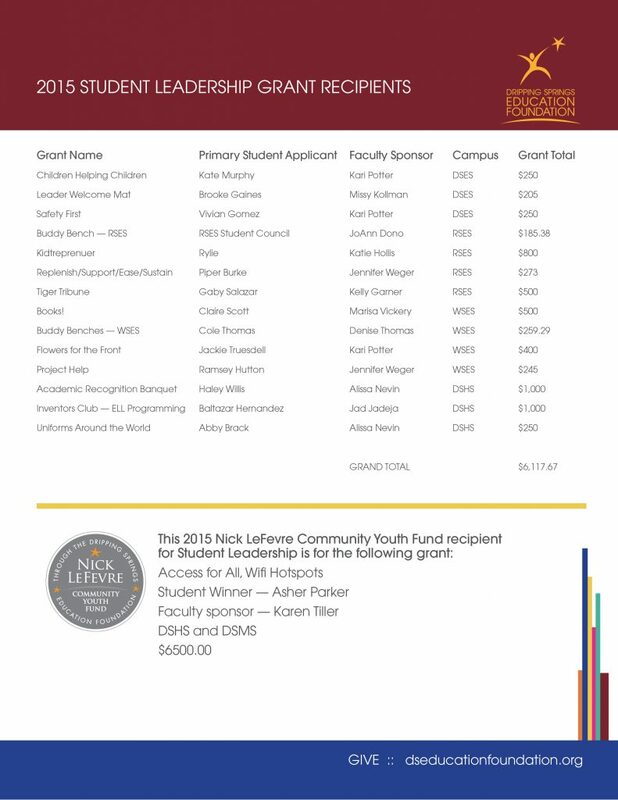 Students, together with their faculty sponsors, apply for the grants during the fall semester. Please submit your Student Leadership Grant Application to: admin@dseducationfoundation.org. Applications received on or before 12/31 will be reviewed and scored in January. Grant recipients will be notified by January 31. Applications received on or before 3/31 will be reviewed and scored in April. Grant recipients will be notified by April 30. Should you have any questions, please contact DSEF Board Member, Ben Ingram via email. We are proud of all of these students and their teams, and wish them the best in their leadership initiatives. We are also thankful for the faculty sponsors who are taking time with this “above-and-beyond” activity, investing their time in these students’ lives to help them develop and grow their leadership skills. and their schools, sponsors and administrators! What is the Student Leadership Grant all about? This is a student leadership grant; we place an emphasis in our evaluations on seeing that the student or students will be involved in leading others during the execution of their project, not just doing something good by themselves. We will evaluate how they plan to involve and lead others. What kinds of projects will the Foundation fund through this program? What type of projects will the Foundation not fund? The Foundation will not fund projects or programs that are clearly not student-led or student-inspired. While we realize many of your younger students will require more direction, we want to ensure they are able to practice their leadership skills throughout the entire process. Our goal is to focus on the process and less on the product created by the student-lead program. We cannot fund projects that have the sole intent to purchase equipment, furniture or supplies that the district will/should provide. Who will be reviewing the application for grants? All applications submitted will be reviewed by a five-person committee. Two reviewers will be board members from the Foundation while three reviewers will be members of the community and/or school district. 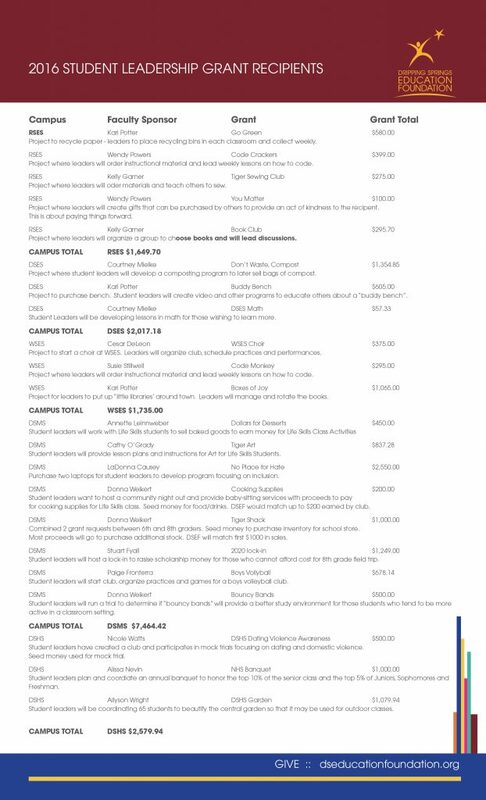 Why is there a limit of $1000 for the Student Leadership Grant? There is actually no hard limit on the amount of the grant. The $1,000 limit is a suggestion based on the amount of grants approved in the past. Some projects will require more funding, while other projects will require less. We want students to think big, and to consider that the grant money should be spent by the end of the school year. What happens if my request is not approved? If your grant is not approved, you will be contacted by a member of the reviewing committee. In some cases, the scope of the request may fall outside of our parameters, while in other cases, the project may simply need to be modified. Our goal is to say “yes” whenever we can. How much time does a sponsor need to spend on this? Each project is unique and the requirements of a sponsor will vary considerably. With younger students, the sponsor will be more involved, while with older groups students, they can take a much more active leadership role. The scope of the project will also determine the involvement of the sponsor. All applications submitted should list the involvement of the sponsor. What if my completed project falls short of accomplishing my goals? While we are interested in the product of the grants (what the program will accomplish), we will emphasize the process (how the students will grow and benefit by doing it) in our evaluation. As with any learning, “smart tries” are encouraged. While we want all projects to meet their goals, if the students had an opportunity to exhibit and learn leadership qualities, then the program was a success. I am helping with the application for an elementary student. Some of these questions seem geared toward middle or high school students. You are correct. The application is geared toward a general audience. We encourage elementary students and those who need assistance to seek help from their faculty advisor. Who handles the money for these grants? 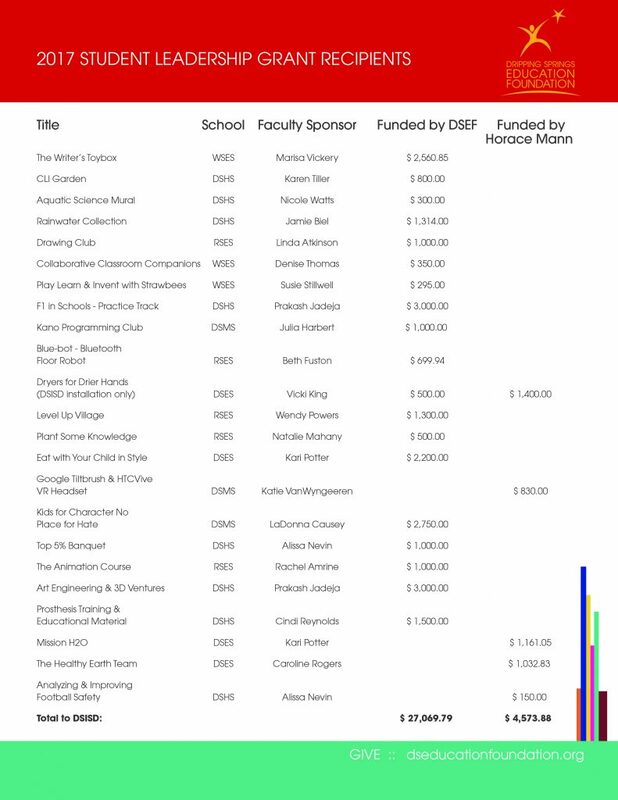 The faculty sponsor will be entrusted with the funds on behalf of the student leaders. When will the grant money be disbursed? Grant money will be distributed within the first two weeks of January. We want to thank the Foundation for our grant. What is the best way to recognize the contribution? Publicity! Our objective is to grow this program and provide for more grants in the future. Document what you do and share it. Send your pictures to your school for the newsletter, but also send them to the Foundation for placement on our website and on our Facebook page. We want to publicly recognize your group as much as you want to thank us! Additionally, you’re encouraged to ask friends and family to contribute to the Foundation. The more we receive, the more we have available to fund outstanding projects. Lastly, patronize businesses who support the Foundation and let them know you received a grant. They want to share in your success!